Hot models and summer fashion took center stage as the second Pattaya Fashion Week debuted at the city’s two major shopping malls. Deputy Commerce Minister Alongkorn Pollabutr and Mayor Itthiphol Kunplome opened the event at Central Festival Pattaya Beach May 13. Spring and summer fashions were shown off there and at nearby Royal Garden Plaza through May 15. 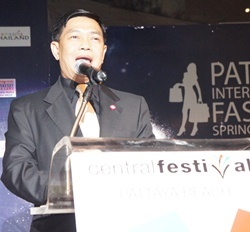 Deputy Minister of Commerce Alongkorn Pollabutr gives the opening speech at the fashion show. Itthiphol said the fashion show is part of the ongoing Pattaya Grand Sale promotion and that fall fashions will be shown off during another Fashion Week event before the Grand Sale concludes in August. Miss Universe 2005 Natalie Glebova was among the famous models to walk the catwalk at the Central Festival opening ceremony. Designers representing more than 20 top brands showcased their latest designs. Following the show, Alongkorn and the models adjourned to the Nova Platinum hotel for a Fashion Week feast. Miss Universe 2005 Natalie Glebova was among the famous models to appear at the show. (Above & below) Top international models showcased the chic designer garments to onlookers. A large gathering of the local and national media were in attendance to record the fashion extravaganza.